Today’s guest blogger is Dixie Phillips. She is on a virtual book tour with Pump Up Your Book Promotion to discuss one of her newest releases, One Noble Journey. Make sure you read to the end of this post to find out how you can win a copy of One Noble Journey. My husband and I have been in fulltime ministry for nearly thirty years. We have discovered even on the best days – life can be difficult. Parents are weary of hearing bad news and long to escape the pressures from the daily grind. They fear for their children’s future and crave an infusion of hope. An inspirational book has the power to transform the mundane into paradise and become an important building block in their child’s faith. In 1988, our church started a Christian school. As we began training the students, we understood in order for them to experience optimal spiritual health they needed appetizing “soul food.” Force feedings were never beneficial. We realized rigid rules without a healthy relationship would breed rebellion in a child. They needed to laugh often and be loved unconditionally. Blending faith and fiction in children’s literature is another way we can pass our beliefs along to our children. The characters of a story can be chiseled on the heart and conscience of a child; shaping their small souls and causing them to embrace timeless truths from God’s Word. Every day children are bombarded with conflicting messages and destructive images. Parents cannot afford to be silent, but must be proactive and provide positive character-building literature, which will nourish the child’s spirit and help replenish relationships, encourage significant conversation, and foster a vibrant faith in the heart of the child. I believe the seeds of influence from my children’s books – Angel Eyes, Stubby’s Destiny, One Noble Journey, Baby Jesus is Missing, and the children’s books I write in the future, will live longer than I do, produce a harvest of wisdom and help ignite a blazing faith in the hearts of children, which will change a generation and time my eyes may never see. Dixie Phillips began writing seasonal plays for children in 1987. These delightful programs have been published by Abingdon Press, Standard Publishing, Eldridge Publishing, Evangelizing Today’s Child and Gospel Publishing House. 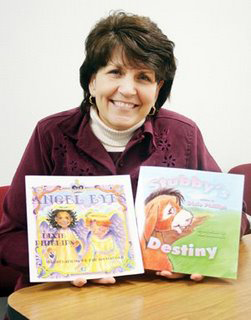 One of Dixie’s children’s books, Stubby’s Destiny, was awarded the 2008 Best Children’s Animal Story by Books and Authors. Guardian Angel Publishing has released Angel Eyes, One Noble Journey and Baby Jesus is Missing. Cinderfella and the Furry Godmother and Stilts the Stork will be released in 2010. Dixie also has a passion for writing God’s truths for adults. She has contributed to an award-winning devotional book and has ghostwritten books on marriage, health, poetry and personal testimonies. She is currently a topical curriculum writer for Randall House. Dixie is a pastor’s wife of more than 30 years. She and her husband, Paul, have four grown children and have served the Gospel Lighthouse Church in Floyd, Iowa, for 28 years. To see where Dixie stops next on her virtual book tour, visit http://virtualbooktours.wordpress.com/ every weekday in December between now and December 16th. 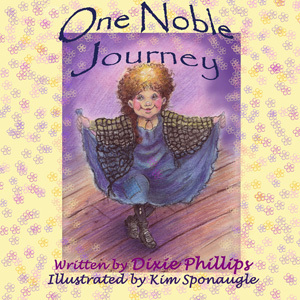 ENTER TO WIN A COPY OF ONE NOBLE JOURNEY BY DIXIE PHILLIPS!!! 3) Get two additional entries for tweeting about this contest. Don’t forget to let us know here that you tweeted! This giveaway will run from today until 11:59 p.m. (Eastern) on December 31st. A winner will be announced in early January. Stubby is a donkey who feels he has been born all wrong. He’ll never find his Divine destiny because he’s got poor posture, doesn’t have a regal stance like Sly the stallion, and is always in the wrong place at the wrong time. Stubby never would have thought that he would be chosen to carry the King of Kings. This might just be my favorite Christian children’s book. The minute we received Stubby’s Destiny, my five-year-old daughter wanted to read it. In this simple tale of a defeated donkey who ends up being chosen to carry Jesus into Jerusalem, children quickly learn about God’s love and following His plan. As an AWANA Leader, and having taught Sunday school children for nearly twenty years, I know how challenging this concept can be for young people. It’s a concept we covered in this year’s Vacation Bible School program, and it is one that can’t be taught often enough. Here is poor Stubby, thinking he’ll never amount to anything, and yet, he is chosen for the important task of carrying the King of Kings. How can children not be uplifted when reading such a story? My daughter instantly fell in love with Stubby, and the touching and beautiful illustrations provided by Kim Sponaugle, make Stubby’s story even better. I applaud Dixie Phillips for being able to reach the heart of a child with her simple, but important story. Stubby’s Destiny is a favorite in my house, and it will soon be in yours too!